West planned our pilgrimage such that we began with the oldest remaining structures and tombs first and then gradually worked our way forward in time. The Step Pyramid at Saqqara, covered in previous posts, represented the largest stone complex known to the world when it was built. (if one agrees with the accepted age attribution of the Sphinx and its temple complex--which most of us on this trip didn't, but it gives you a relative idea). 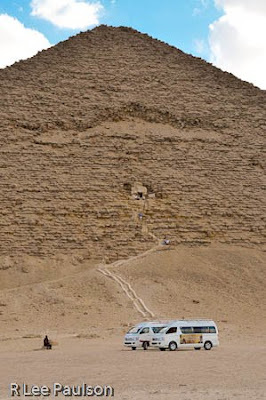 I neglected to mention in previous posts that the step pyramid, which many Egyptologists consider to be the 'prototype' for other pyramids that followed, was revised and enlarged several times. The chronology of those changes is unclear. It is not unreasonable to presume that the reconstruction and enlargement continued after other of the 'later' pyramids were built. Given the precise, clean lines of the temple complex that still stand, I for one, have a hard time swallowing the 'prototype' theory. Whoever designed the place knew exactly what they were doing. Also, I neglected to mention any details of the wall surrounding the complex. Made of mud brick, it enclosed a courtyard shown in previous posts, which was nearly 600yards by 300 yards. Sorry, I didn't have the exact dimensions, then. The wall was originally 30 feet tall. This wall, all by itself would have been an impressive building project back that long ago. Add in the pyramid and the rest of the temple complex and even today one staggers to imagine the effort to build such a massive structure. Here is an overview shot that Melony took, showing some of the reconstruction taking place outside the complex walls. It will take modern earth moving equipment to get rid of enough sand to reveal still other buried structures that litter this area. One of the problems with older excavations is that, in digging out specific areas, they dumped sand on other areas of equal or greater interest. As mentioned before, we are talking about many square miles of sand that will need to be removed in order to fully excavate the place. So, we leave the Saqqara complex, have lunch under a tent at a tourist place that serves authentic Egyptian food to countless bus loads of tourists each day. 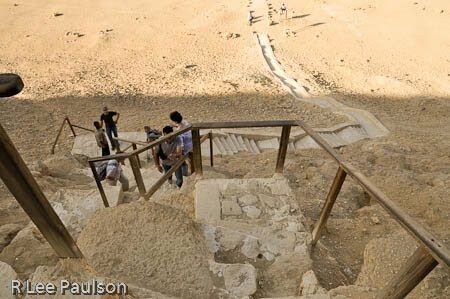 However, it is more or less on the way to Dashur where we visited two wonderful pyramids. The first, the Red pyramid, we were allowed to enter. 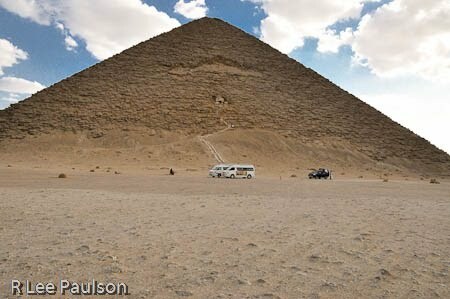 The Red pyramid occupies nearly the same area as the great pyramid at Giza, however it has more gently sloping sides. Still, it is quite formidable in size when one stands in front of it. Here is a shot of the inside. Notice the short, narrow passageway leading out. 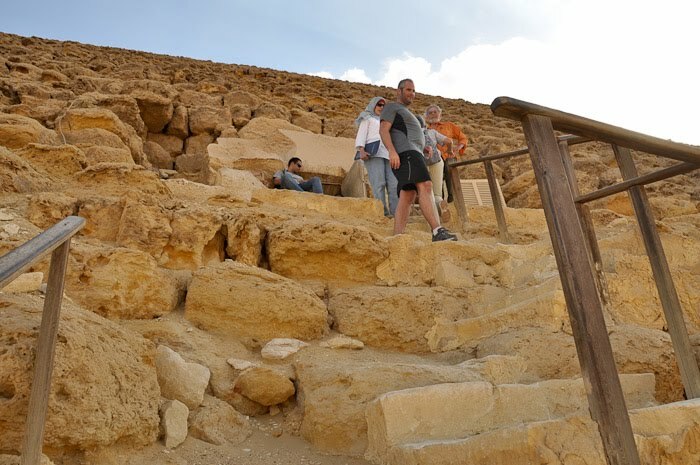 Either the Egyptians of old were very short or they had some other reason for making the interior passageways so short, narrow and steep. 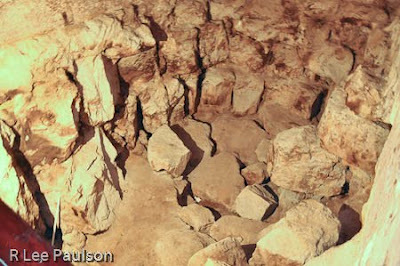 Here is a half second, hand held exposure of an inside chamber, (thank you VR lens) one of two chambers like this. West is having us stand in the corners of the chamber and OM. The chamber, both of them, actually, rang like bells. Here again, the ancients incorporated sound as an integral part of their design. This, all by itself, convinces me that master architects were at work here. Seeing people standing in the photo above will hopefully give you and idea of the scale. Looking up, one can see how perfectly the corbeled roofs were constructed. Unfortunately, I don't have a shot of the staircase in the other corbeled chamber like this. But, imagine a stair case leading up fifteen or twenty feet to a side chamber. This side chamber, the Egyptologists contend, is an unfinished tomb area. We took the steps up and found ourselves on a narrow, short walkway which overlooked these rocks in a pit below us. It was hot, cramped, and crowded on the walkway above this rock pile. For some reason I was having trouble getting my flash to work properly and the white balance correct. Could have had something to do with the difficulty of seeing the camera settings in the dark. Or, more likely, I was just just having a senior moment. Anyway, you get the idea of what the unfinished area looks like. I personally have serious trouble with the idea of this being an unfinished tomb, as is usually suggested. For one thing, the ancients would never have expended this much effort to build a structure this large and leave it unfinished. From all appearances, they left this chamber unfinished for a reason--we just don't know for certain what was. For another, why is the chamber so high off the ground? Instead, it makes much more sense to me that this chamber represents a way of tuning the outer chambers to some desired frequency. West also pointed out that, though it's hard to see in this photograph, these rocks show distinct signs of weathering. Was this pyramid build around them, on top of a much older site? Were they brought in from outside? No one knows. 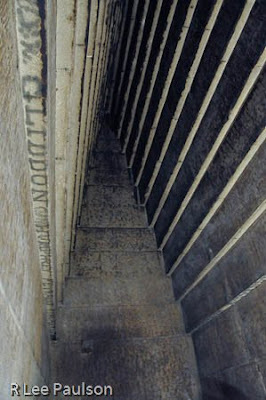 Here is a scan from West's guide book, used with his permission, showing the interior of the Red Pyramid. One can see how high the 'tuning' chamber is on the interior chamber. 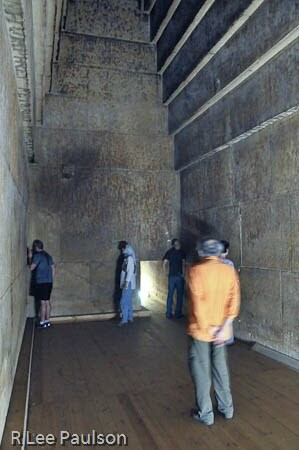 Notice also how long the descending passageway into the interior chambers is, compared to the size of the pyramid. Heading back up as I made my way out, bent completely over at the waist, duck walking using only with my knees and ankles, the long, steep, narrow passageway appeared to be a path into oblivion. Here is a shot from the entrance hole in the side of the pyramid looking down. Sheahan, in the black shirt with his hand on his hip, is only about fifteen feet forward of me. Here is one looking up. One of the frustrating aspects of photography it is so very difficult to show just how steep a slope is. Pictures tend to flatten everything out. Maybe this will give you and idea of just how far up that entrance was. And, just how far down one had to walk in that cramped, narrow, short passageway to reach the rooms below. This was taken with my wide angle lens. Now, maybe you have a better idea as to the relative size of the structure. The interior passageway takes one all the way back down to the level of the vans parked in front. The ever present tourist police, making sure that we are safe. Notice the automatic rifle the man in the center is holding. 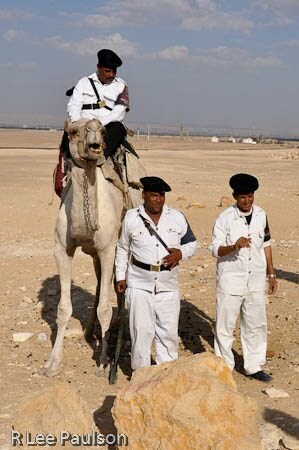 The man on the camel also had one in his saddle. One advantage of my telephoto lens was that I could zoom in on them without being too intrusive. 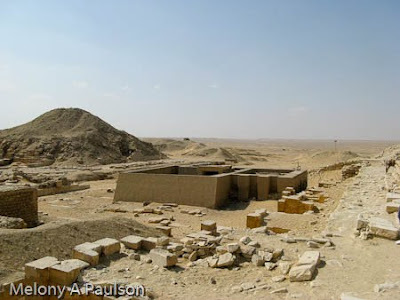 Our next stop, the Bent pyramid, barely a mile away. 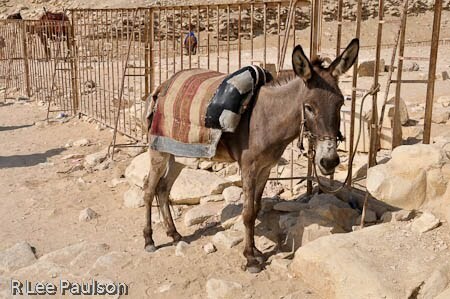 Egypt 1: We get there.